In 1942, the people of Honduras were almost unaware of the major conflicts of the time. Grappling with underdevelopment, the country lacked an academic program in agriculture. 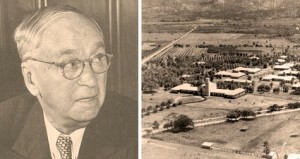 During this time, Samuel Zemurray, a prosperous businessman and banana trade tycoon, was willing to invest a great amount of money to establish a first-class agricultural school for the region’s young men with scarce resources. To ensure the success of his new philanthropic project, Zemurray leaned on the advice of Dr. Wilson Popenoe, a famed horticulturist and agricultural explorer who also consulted for the United Fruit Company and the United States Government. Popenoe would become Zamorano’s first director and, alien to the conventionalisms and academic practices of the time, would embed the style and educational methodology that has been an emblem of the institution for decades: Learning by Doing. As mentioned by Dr. Simon Malo —director of Zamorano between 1979 and 1992— in one of his writings: “The creation Zamorano was in many ways a sweeping human drama, not different from the others that shaped the region.” However, this creation has had a favorable effect on thousands of people, not only on students and their families, but also on employees and their families as well. Far beyond all this, Zamorano has been essential in transforming the agricultural sector and in developing rural areas of more than twenty countries in Latin America, from which our graduates hail.